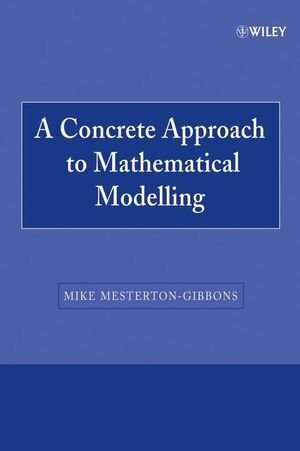 Wiley-interscience A Concrete Approach to Mathematical Modelling (Wiley-Interscience Paperback Series) by Mike Mesterton-Gibbons | Free eBooks Download - EBOOKEE!
" . . . [a] treasure house of material for students and teachers alike . . . can be dipped into regularly for inspiration and ideas. It deserves to become a classic." "The author succeeds in his goal of serving the needs of the undergraduate population who want to see mathematics in action, and the mathematics used is extensive and provoking." "Each chapter discusses a wealth of examples ranging from old standards . . . to novelty . . . each model is developed critically, analyzed critically, and assessed critically." A Concrete Approach to Mathematical Modelling provides in-depth and systematic coverage of the art and science of mathematical modelling. Dr. Mesterton-Gibbons shows how the modelling process works and includes fascinating examples from virtually every realm of human, machine, natural, and cosmic activity. Various models are found throughout the book, including how to determine how fast cars drive through a tunnel, how many workers industry should employ, the length of a supermarket checkout line, and more. With detailed explanations, exercises, and examples demonstrating real-life applications in diverse fields, this book is the ultimate guide for students and professionals in the social sciences, life sciences, engineering, statistics, economics, politics, business and management sciences, and every other discipline in which mathematical modelling plays a role. No comments for "A Concrete Approach to Mathematical Modelling (Wiley-Interscience Paperback Series)".